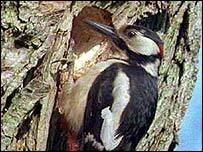 Woodpeckers have caused £200,000 worth of damage by burrowing through electricity poles in the Scottish Highlands. Eighty poles had to be replaced after the birds' nest building left them unsafe. Scottish Hydro-Electric said the damage had forced the company to replace 10 times as many poles as normal. "The damage to the wooden poles by woodpeckers is a rather unusual feature," said refurbishment team manager Stephen Orr. "We are used to experiencing what mother nature can do to lines, but more by the weather than by the animal kingdom. "Typically an average line refurbishment will require one pole change per kilometre - but this project has required 10 per kilometre. "Several of the damaged poles have holes drilled right through them." The company had to replace 80 poles in the Highlands, at a cost of more than £200,000, because the woodpeckers' drilling had left them dangerously unsafe. Fifty had to be erected around Oban in Argyll, with 30 being replaced in Glenelg, Letterfearn and Arnisdale in the west Highlands. A spokeswoman for the power company said it could not use different materials to thwart the birds. "We just do not know what to do. It is a problem we will have to live with and replace the poles when they are drilled too much," she said. "We have thought about bringing in bird experts but that probably will not make any difference. "It is incredible the rate the woodpeckers are drilling."